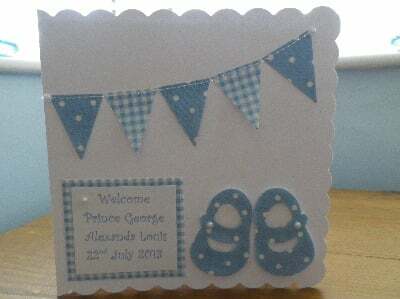 A lovely handmade card with Cath Kidston fabric cut into cute baby shoes and mini bunting flags. I have sewn the bunting to the card and embellished with tiny pearls. This lovely card measures 15cm x 15cm and has a white envelope. Personalised with baby details on the front and left blank for your own message inside on the paper insert. Available in blue provence and pink dot and blue dot with blue check. They are so pretty you could pop them in a frame to make a picture, so really a card and a gift in one!